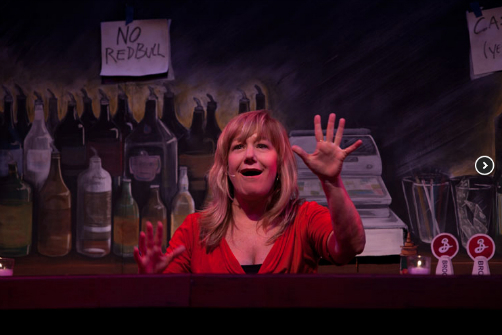 Terri Girvin in Last Call. BOTTOM LINE: A poignant but not fully realized solo production about juggling full-time work with the care of a mentally ill parent. Long-time bartender Terri Girvin certainly knows what it’s like to pour libations for New York City’s thirsty masses. There are would-be patrons who are underage, as well as those who demand instantaneous service. Furthermore, there are sexual harassers, sloppy drunks, and a mess of lonely hearts looking for a sympathetic ear. It’s a constant balancing act and Girvin’s Last Call uses her two decades of on-the-ground experience to give tragicomic voice to the rag-tag characters she’s served. This puts Girvin, as Gwen’s sole female child, in a horrible bind because she’s been deemed responsible for her mom’s care and upkeep, a thankless task made worse by the fact that mom is about to be evicted from her $450 a month California home. It’s a crisis writ large because the under-employed Gwen can’t afford a new place. Her solution? She’ll move to New York and into Girvin’s tiny Manhattan studio. Girvin is a highly expressive performer, and her ambivalent reaction to Gwen’s demands makes her a sympathetic figure. She is also physically adept, moving between her own persona and that of Gwen with seamless and graceful agility. What’s more, Phil Palazzolo and David Hart’s sound design is masterful; the bustling bar, and the pouring and shaking of drinks, are not only fully audible but perfectly timed. So are the frequent phone conversations between Girvin and Gwen. The angst-filled and often-funny story—delivered with “if you don’t laugh you’ll cry” affectation—sputters nonetheless. Although Girvin declares she’s done with her mom, and insists that she’s going to cut Gwen completely out of her life, these words spill out in a moment of pique and fury. Does she actually follow through on the threat? If so, do they ever reconcile? Or does Gwen ignore her daughter’s apprehension and simply show up on her NYC doorstep? Sadly, I can’t answer any of these concerns—and neither can anyone else who sees Last Call. In fact, the play simply stops. It’s disappointing, rendering the production unresolved and seemingly unfinished. Still, Girvin is a terrific performer, and Last Call has the makings of a nuanced look at the ways mental illness impinges on loved ones and adds to the enormous stress of everyday life. With a bit of development to tie up loose ends in the script, it has the potential to become a moving addition to the family dysfunction genre.